American Airlines has received an "unsolicited" approach from Qatar Airways which wants to acquire 10% of the US carrier. In a regulatory filing, American Airlines said Qatar intended to buy at least $808m (£638m) of its shares. American Airlines said it would respond "in due course". Shares in American Airlines, which is the biggest airline in the world, initially rose 5% but fell back to a 1.2% rise by afternoon trading. Qatar Airways said it sees American as a good investment opportunity and would not involve itself in management, operations or governance. 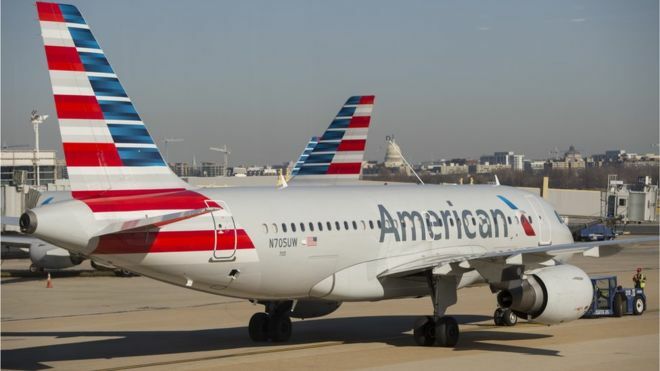 "Qatar Airways believes in American Airlines' fundamentals," the firm said. In 2015, Qatar Airways took a 10% stake in International Airlines Group (IAG), the owner of British Airways and Iberia. Then in July 2015 it increased its stake to 20%, becoming IAG's biggest shareholder.